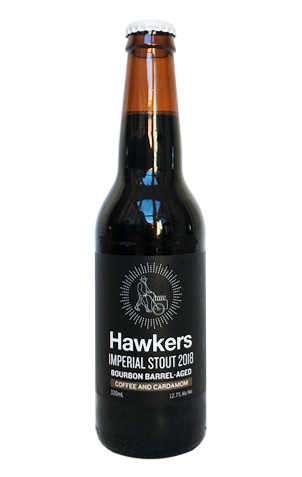 Back in his days at 961 Beer in Beirut, Hawkers' co-founder Mazen Hajjar created an imperial stout inspired by Lebanese coffee. It featured cardamom and coffee and now, several years later and at a different brewery in a different country, he's at it again. This time around, it's one of a few variations on the brewery's 2018 Imperial Stout, one that has spent time in bourbon barrels as well as being dosed with those two adjuncts. As with some other barrel aged releases from Hawkers – think of last year's maple syrup imperial stout or this year's blood orange barleywine – you're left in no doubt there's something extra at play here, with the cardamom popping from the glass in an instant, the impact not dissimilar to biting into a pod when tucking into a curry. Its less potent to taste, but not alone in giving the beer a distinctive feel. There's an intense orange citrus character – a visitor at Crafty Towers who would never have come across a beer anything like this before suggested Cointreau – and, taken together with the full-bodied imperial stout that pokes its nose in late on, the experience is one that had us transported to a shisha bar, hookah in hand.